Drivers Start Your Engines! #VRewards = 10x AIR MILES Rewards* & @YummyMummyClub Contest for $500 of Shell V-Power Premium Fuel! 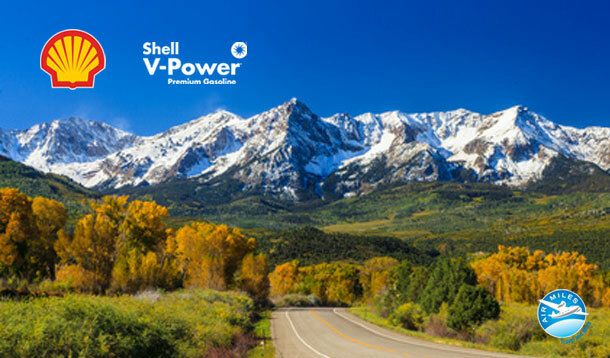 Where would you go with $500 of Shell V-Power Premium Fuel? I love road trips whether it be our annual summer family road trip, or my twice a year girls shopping weekend. That is why I'm sharing these three exciting events and promos that are happening now to help you get started on your next road trip. You could win $500 of Shell V-Power Premium Fuel and 100 AIR MILES reward miles in the Yummy Mummy Club Contest that would put you in the driver's seat of whatever type of road trip spins your wheels! Right now until Nov 9th, 2014 participating Shell locations are offering #VRewards. You can earn 10x AIR MILE rewards when you fuel up Shell V-Power Premium Fuels (with a minimum $30 purchase). As a #VRewards Social Media Ambassador I get the privilege of visiting the Shell Station located at 1548 Merivale Road, Ottawa on November 5th from 3:00 - 5:00 pm est and participate in the #VRewards promotion of surprising and delighting some lucky customers* at the pump with Shell Gift Cards and AIR MILE reward miles! I feel like the #VRewards Fairy! Be on the look out for tweets and pics of the lucky delighted customers with the hashtag #VRewards! There are #VRewards Social Media Ambassadors surprising and delighting in London, Ottawa, and Toronto throughout the promo period! It is as easy as One Two Three! Three ways you can be #VRewarded! Yep, just me Cathy thinking out loud about #VRewards. *Note: Conditions apply. I will be surprising and delighting customers purchasing fuel and using their Air Miles card who are willing to participate in the social media aspect of the promotion and sign the appropriate waiver. Note: I was not compensated for this post. 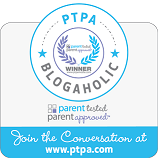 This post was merely to share with my readers about this contest, promo and event. I have been compensated for my time during Surprise & Delight Customers on-site visit to a Shell Station. This on site visit has been organized by Yummy Mummy Club and sponsored by Shell Canada. Good luck and happy travels! It's October; the leaves are changing colour, squirrels are busy gathering food, birds are flying north, or winterizing their nests. There is a plethora of activity all around us. So many mysteries like; Why do the leaves change colour? How do the birds know when to fly north and where to go? This is a perfect time for long nature walks to discover and observe all this activity, by playing detective and solving some of life's mysteries. For instance did you know that Porcupines can climb trees? 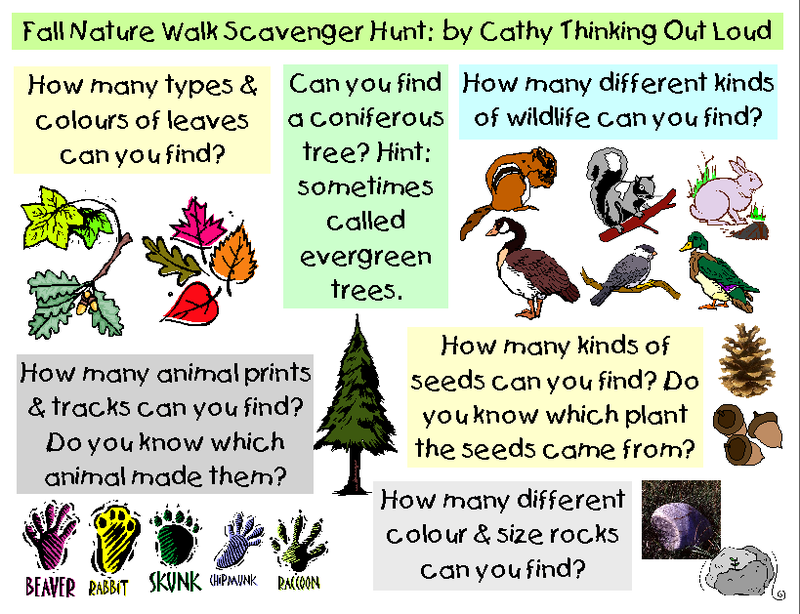 Why not try out your sleuthing skills with my Family Fall Nature Walk Scavenger Hunt and see what you discover? I'm sure you will come up with lots of things that will need further investigation! Be like Blue from Blue's Clues and Inspector Gadget; follow the clues and investigate all the interesting things around you. 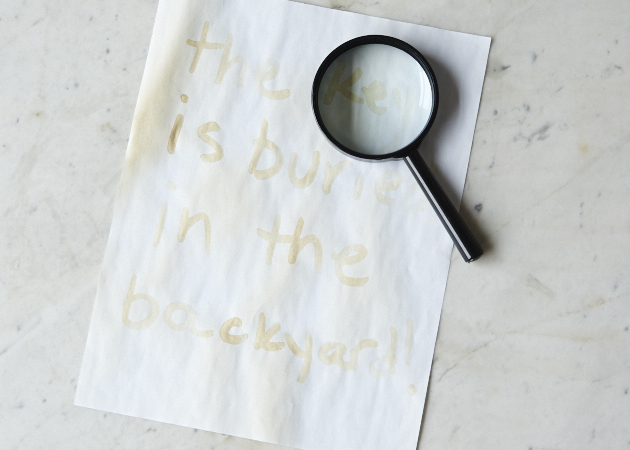 Be sure to bring an I SPY Private Eye notebook to make notes. No need for the mystery solving to stop here. I have left more clues below to help you find lots shows and movies that are perfect for an I Spy Private Eye. Plan on being an I Spy Private Eye? Well you'll need the tools of the trade including a notebook, Invisible Ink and Mystery Mac & Cheese to give you energy! Yep just me Cathy thinking out loud about Netflix Stream Team. Count them ... take your time, I'll wait. 5 Devices aka Minimum number I take to a conference. That is right 5 devices. The average day at a conference is 12 hours long. The average battery life for my devices is not! A portable source of power for my devices would be a lifesaver. Literally The Lifesaver III is the portable power source for my devices! If I am going on a road trip, or vacation and bringing the teens and Hubby you will need to multiple that number by at least 4 with the tablets, PSVita, PSP, Ipods, cell phones, and bluetooth speakers, not to mention the GPS. There are only so many outlets in my van or in an airport, and only so much teenage boy whining I can handle ... and the one way to keep teens quiet and contented on long trips is to have their various devices charged. The Lifesaver III dual ports does not share output Amps; it has 2.4 Amps on one and 1.5 Amps on the other for a total of 3.9 Amps output. I think you get the picture (well only if camera battery is charged). Having a fast and easy charging option is not a luxury it is a necessity. I can say with certainty my experience at BlissDomCA this year was greatly improved by being able to charge my phone as I participated in workshops, sessions, and listened to speakers. Can fully charge a smartphone in under an hour. Has 2 USB portals, so I can charge more than one device at a time. Has capacity to charge several of my devices before needed to be recharged. It will stay charged for up to 3 months when not in use. I would like it if The Lifesaver III came in other colours like The Lifesaver II. The people at Everik International Inc, the makers of The Lifesaver III have been kind enough to give my readers a chance to win a The Lifesaver III of their own! 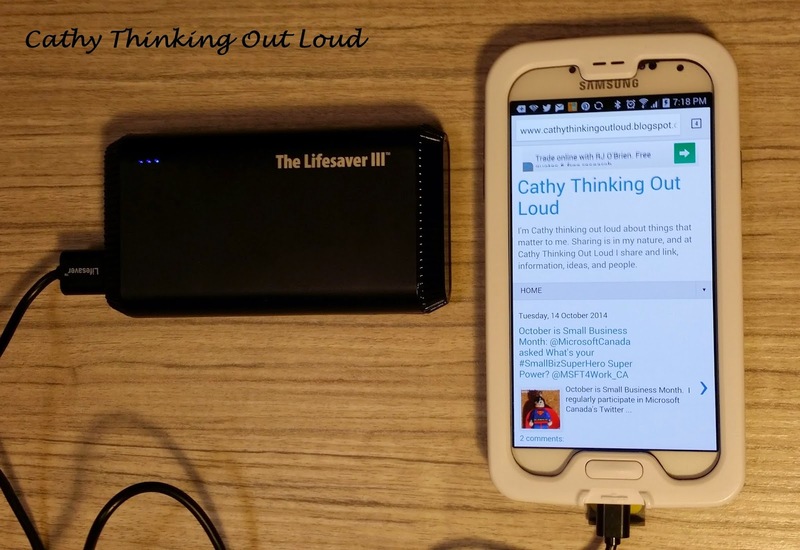 Why not visit Everik International Inc on Facebook or Lifesaver Power on Twitter say thanks for the giveaway and tell them Cathy from Cathy Thinking Out Loud sent you! This giveaway is open to Canadian residents 18+ years (excluding Quebec) and runs from Oct 17th - Nov 14th. 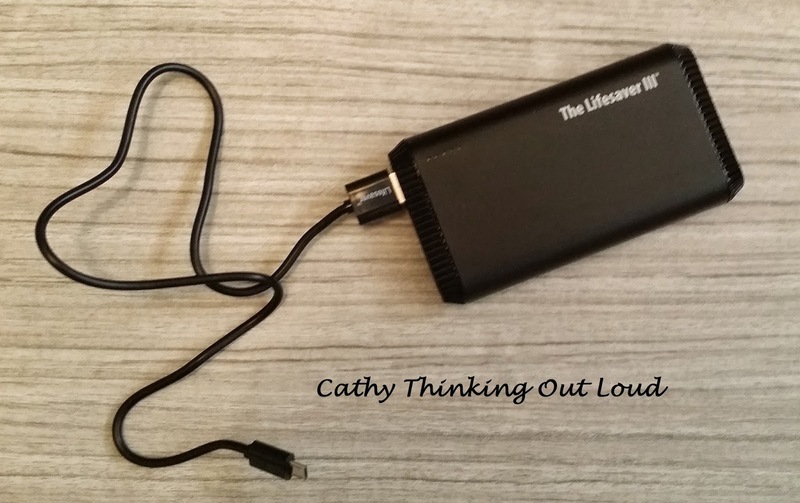 Yep, just me Cathy thinking out loud about portable power! Note: I received a Lifesaver III for the purpose of this review. All opinions are my own and reflect my personal experience with this product and brand. I regularly participate in Microsoft Canada's Twitter and MSFT for Work CA Twitter Wednesday Question, so when I saw this go by in my twitter feed it got me to thinking. 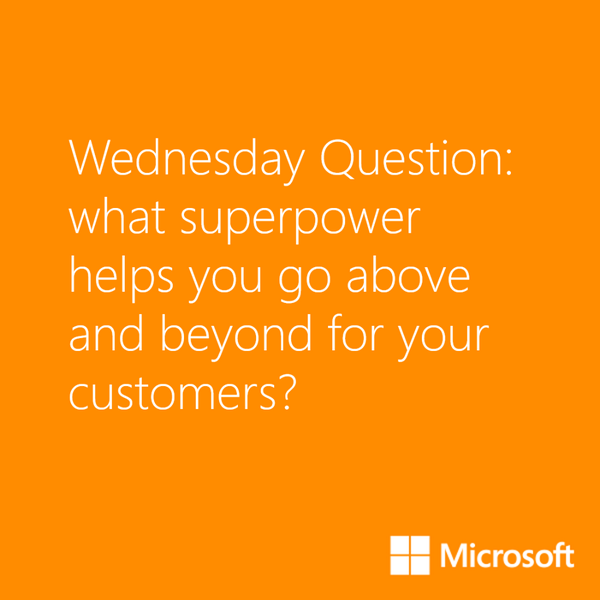 What super power did I think was essential for Small Business success? In my mind success includes going above and beyond for customers. The super power I see as vital for small business success is vision. I don't mean a vision for the business, although having a vision and plan for where you want to go is important. I am referring to sight and insight. You need a good pair of small business bi-focals! Not the old fashioned ones with a hard line dividing the your near/small and far/big vision. I mean a modern pair of no-line bifocals that allow the user to seamlessly move between and focus on both near/small and far/big picture. Being able to see and respond to the big picture is vital to success in small business. You must stay current and understand the big picture; your market, industry, world trade agreements, world events, and how they impact your small business, and the industry as a whole. How will you stay up to date on this information for your small business to better compete and fit into the larger picture in an ever changing market? For example, how will an increase in gas prices due to world events impact your shipping costs, and your bottom line? As a small business owner it is vital that you are able to focus on the small picture, and the day to day details of running a business. You must have oversight, and insight into: hiring staff, inventory, suppliers, when and what to outsource, pricing product(s) or services, customer service, and your on-line presence to name a few. 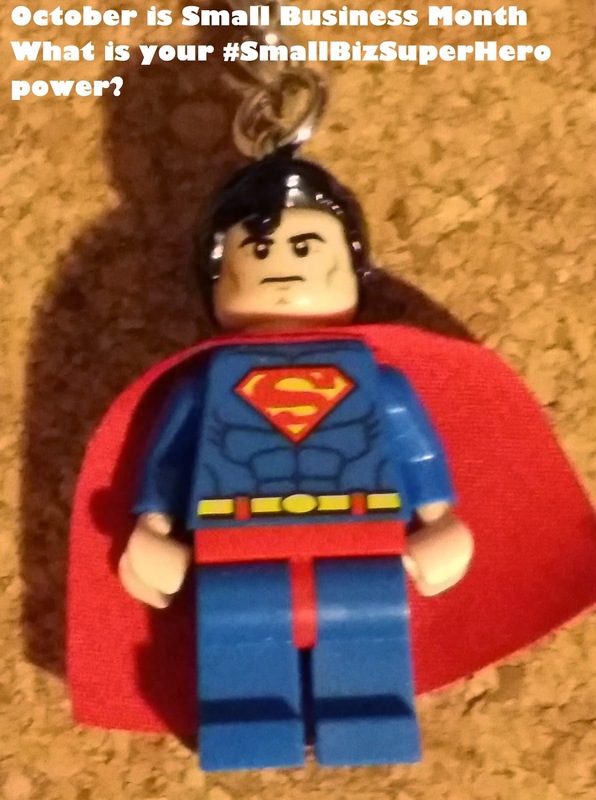 It does appear that you must indeed be a Super Hero to stay on top of all these aspects of running and owning a small business? How do you see both the forest and the individual trees? You would need 20/20 vision! How does a small business owner without 20/20 vision grow their business to it's full potential? Many of us aren't born with perfect vision, but if you "look" there are resources, tools, supports and prescriptions available to correct or improve your vision and bring the big picture and the small picture into focus and balance. 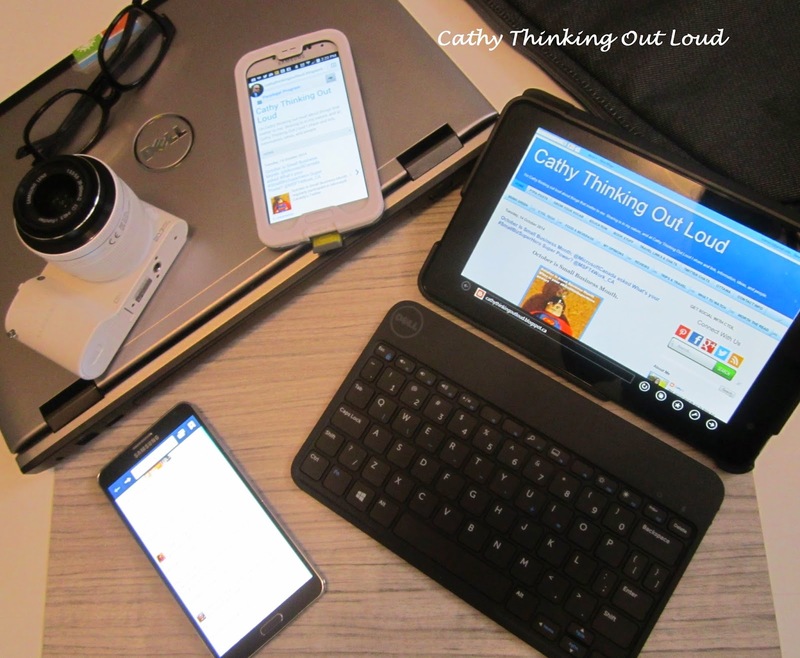 Yep, just me Cathy thinking out loud about #smallbizsuperhero powers. About A Boy... Oliver can #TelusAllAbout his day! Thanks @Telus for #Giving! Do you ever see a post, video or hear a story that restores your faith in humanity? A story that reaffirms your thoughts about a brand and why you choose them as your brand? We have power as consumers and it is one way in which we have a voice. I try very hard to support brands that give back, support worthy causes, and have a policy or vision I can get behind. I want the brands I use to get involved in the communities they sell to on a day to day basis. I love it when they support smaller local initiatives, and not just the larger national ones with big media coverage. One such brand for me is TELUS. In my opinion we all have a voice, or at least should. Oliver should have a voice too! Telus helped to give Oliver a voice in a very real sense! Telus is in the communication business, and how fitting that they helped Oliver communicate with those around him in a meaningful way! Please take a minute to watch this lovely video about Oliver and how he found his voice with some help from his friends at Ottawa Children's Treatment Centre (OCTC) and TELUS. In the end it is all about a boy, or girl, parent, brother, sister or friend. So this Thanksgiving I encourage you to use your Voice, reach out and Communicate, Give and Thank those in your life that make it special! Remember those around you who need your help to have a voice, and then smile at Oliver's story and that he now can "Telus" all about his dreams and plans for the future. Yep, just me Cathy thinking out loud about a boy. Note: I was not compensated in any way for this post. The purpose of this post was merely to share what I felt was a story worth sharing. I hope you feel the same way and share this story as well. Busy night? 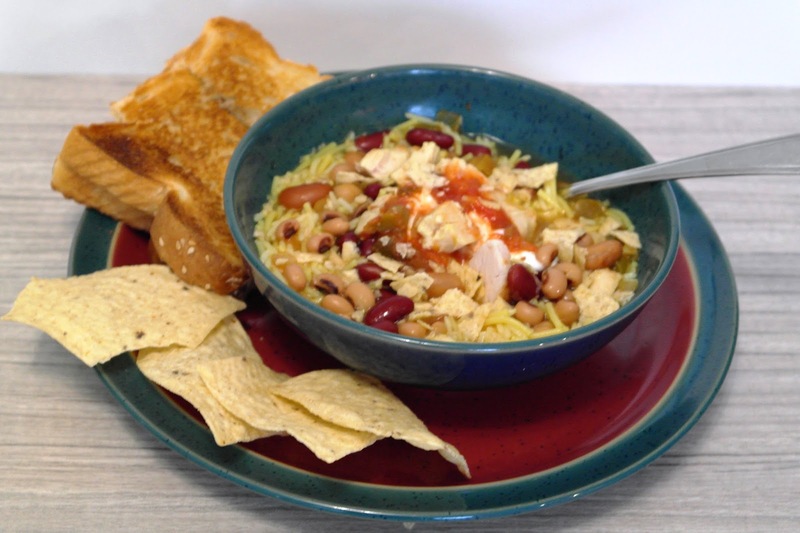 Serve up #DinnerIn15 @MapleLeafPrime Chicken Tex Mex Soup! I need a fast meal to feed my two teens, Hubby and myself, and I need it now! Tick Tock goes the voice in my head ... Tick Tock ... Change that Tick Tock to Tex Mex, cause soup's on! What is easier or more satisfying than a hearty almost made from scratch soup and toast fingers to dip! Bring 1 litre of water to a boil. 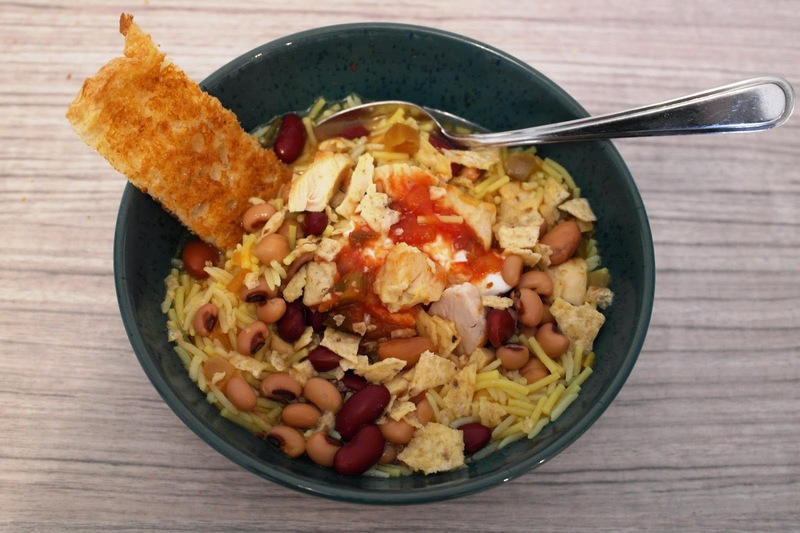 Once soup mixture is fully incorporated, add the rice, salsa, beans, frozen corn, and Maple Leaf Prime chicken. Cover and simmer for 5 minutes or until the ingredients are heated through. Divide the soup into 4 bowls. Add a dollop of sour cream in top of each bowl of soup. Service with toast fingers and tortilla chips to dip. For an Italian style variation to this recipe substitute salsa with drained diced tomatoes, and top with Parmesan cheese. 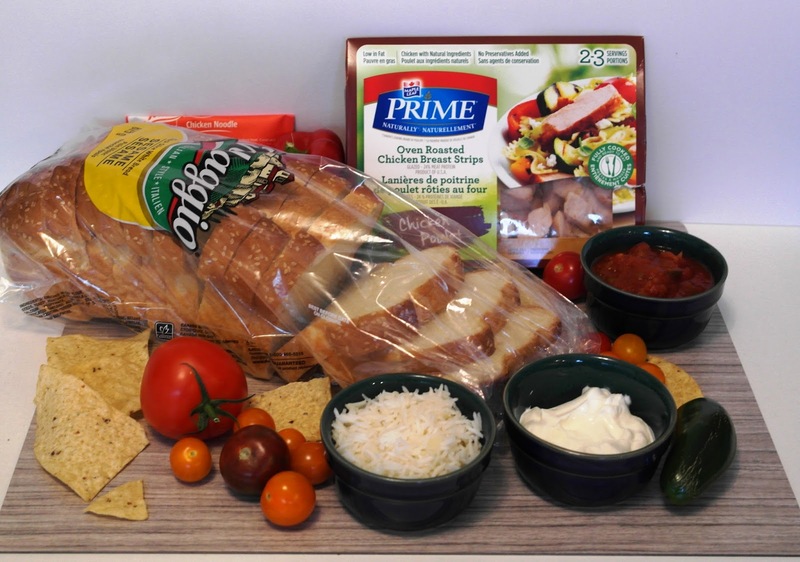 Visit Maple Leaf Prime's website for information on all of their products and great recipes, or follow Maple Leaf Prime on Facebook or Maple Leaf Prime on Twitter. 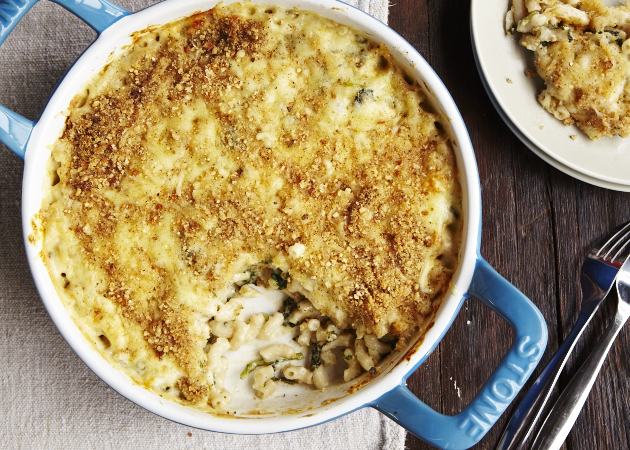 You can find more delicious almost from scratch and from scratch recipes at Appehtite - Dinner In 15 . Yep, just me Cathy thinking out loud about Dinner In 15. Note: I was compensated to review Maple Leaf Prime Chicken Strips. The recipe I chose, and my opinions are my own based on personal experience with this product and brand. Brrr ... the cooler weather means closing windows to keep the warm air in and the cold air out. But in my house the windows are generally kept closed year round because of allergies. If helps to keep the pollen count in the house down and minimize some of my allergy symptoms. We change and wash the filter in the furnace regularly and do all we can to reduce the dust, pollen and allergens. It is a must if I am to survive my seasonal allergies, but closed windows means reduced air flow and stale air. I've never been a fan of spray air fresheners because I often find I react to the scent or aerosol. Candles frighten me because of the flame and fire hazard if left unattended, and I don't want to babysit candles. Did I mention I live with two teenage boys so a little odour elimination and not just masking "teen boy smells" near the front hall and their shoes is much appreciated. 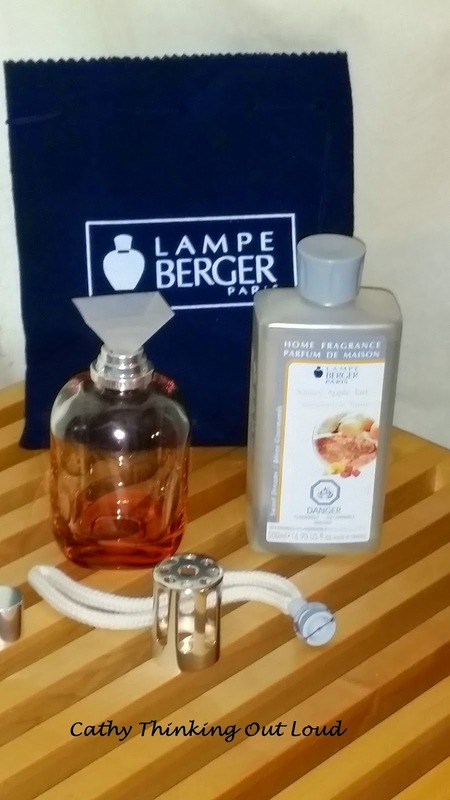 Well let's have a look at another approach; Lampe Berger Paris. Fresh air without sprays, open flames or open windows. Instead they use a process developed by Maurice Berger in 1898 called diffusion by catalysis to eliminate odours and release one of their many fragrance options. Setting up your lamp is straight forward, and it comes with easy to follow instructions. "The duration of the burner's life is 140 hours of diffusion" or "one year of intense usage." For me it is a given that a product has to do what it is suppose to do, and do it well, but I also strongly believe that both function and aesthetically pleasing design can and should co-exist. I want things to look nice and add to the decor of a room as well as do the task they are design for. My personal design preference is the simple lines of mid century modern design. When there is no ornate decoration a product item must rely on the quality of the design and materials used to stand out. This period of design valued functionality as much as design, but was not willing to sacrifice one for the other. 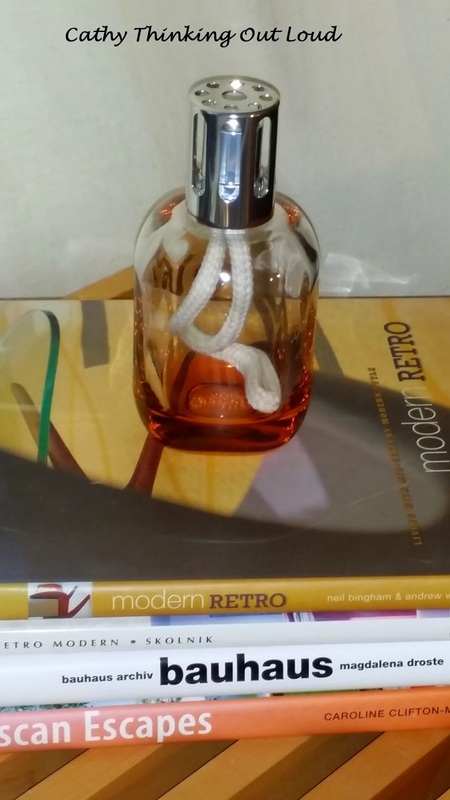 The Lampe Berger Bonbon Orange lamp like mid century modern design, also has clean lines and design. You can feel the quality and weight of the glass the minute you hold it. It loses none of it's functionality by being beautiful to look at, and the understated elegance easily fits into any style of decor. 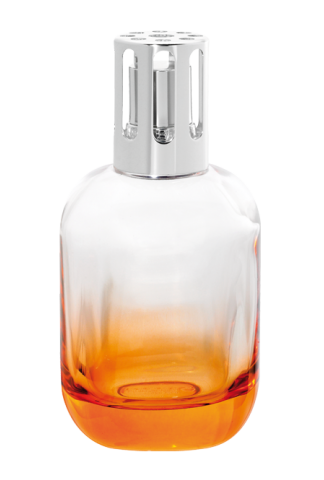 But, if the Bonbon is not your taste Lampe Berger has many styles and fragrances to choose from. 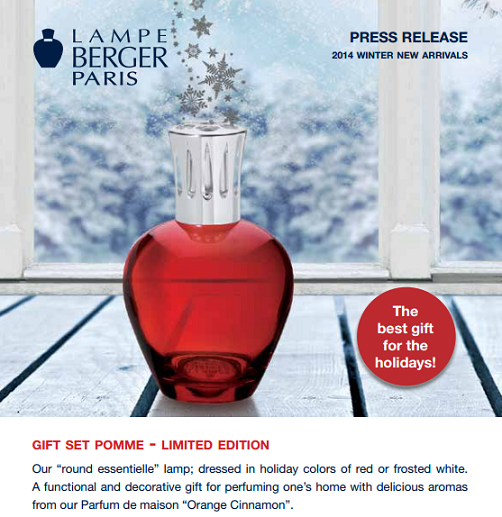 This is why Lampe Berger is at the top of my Holiday gift idea list. The natural wood lamp is perfect for my sister in law, my sister would love the Bonbon in the Frosted Mint colour, and the Pomme Boxed Set in Rouge would make a lovely gift for my Mother in Law. Plus new lamps and fragrances just in time for the Holidays. But this one is for me! Yep, just me Cathy thinking out loud about beautiful pure air. 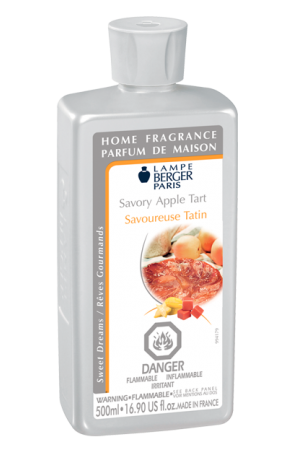 Note: I received the Lampe Berger Bonbon Orange lamp and Savory Apple Tart fragrance free of cost for the purpose of this review. All opinions are my own, and reflect my personal experience with this product and brand. I regularly have conversations on social media and in real life with friends and family about which TV shows, or movies are good to watch. So I thought why not share these recommendations on Cathy Thinking Out Loud once a week, on Wednesday (aka #W2WW). Please share yours in the comments section! After I finished watching all the new episodes of Covert Affairs, one of Netflix suggestions was MI-5, a British spy series, so I did and I liked it. (2002-2011) 86 episodes, 3.7/5 stars. You will find this series gritty and suspenseful, and with 86 episodes to watch it will keep you busy for a while.